This week’s article is short and to the point…Train Your Dog. Training your dog is critical to responsible dog ownership – It’s not an option. If you have a young dog, teach them clear and fair expectations in order to help prevent future behavior problems. 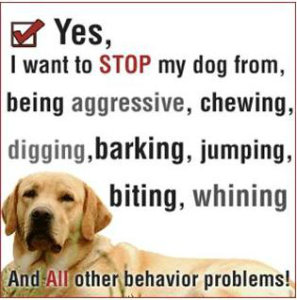 If your dog who is already displaying behavior issues (aggression, mouthing, jumping, pulling on leash, etc.) address these problems immediately. The sooner you begin working to improve, the quicker you will see results. I am not even saying you have to hire me. 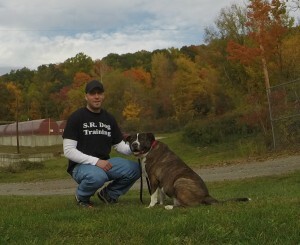 You can train your own dog or work with another trainer to help you. Just make sure you are training your dog using safe, fair, and effective methods – that’s all that matters. Everyone has an opinion when it comes to dog training. If you ask the butcher, the baker, the candle stick maker, and even most “dog trainers” how you should train your dog – you will get a different answer from each of them. Unfortunately, most of those answers will be wrong. So make sure you are using appropriate techniques or working with a qualified professional. Every dog needs to be taught clear and fair expectations, along with obedience commands that they will perform when faced with distractions. Too many dogs are surrendered to shelters and far too many owners are living stressed with a dog who displays bratty behaviors. In virtually all cases, behavior problems could have been prevented or improved upon, simply by training their dog. So please start providing your dog with something they need the most…proper training.